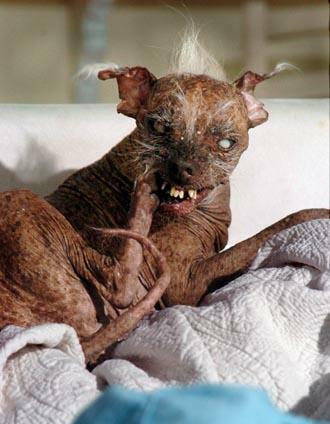 This is officially the world's ugliest dog. I think the appropriate response to seeing it would be, "Daaamn!" The dog's name is Sam. I think this dog already had it'd day. I think it was about 25467545 years ago. Wait--how do you know that's a dog rather than an extremely large rat, or a Gremlin, or Salacious Crumb? Hey Man that is pretty UGLY! I hav seen many dogs in my life but that beats them by far! and I hope you adopted it. Yeah, thanks I am scarred now. Are you sure that thing's not a Sumatran rat monkey? It reminds me of the killer lab rats from this episode of the new (90's) Twilight Zone series. Is that one of the zombie dogs that's been in the news lately? What's the governing body on Fugly Dogs? Is it like the USOC? Is Jaques Rogge in charge? Or Mit Romney? If you don't stop posting naked pictures of my wife on the internet I may have to sue. Excuse me while I recover from the head trauma I'm sure to recieve after she reads that. I got it, I got it, I got it. Okay, remember when the Avengers West Coast (or was it West Coast Avengers) went to Hell because Scarlet Witch's kids went missing and it turned out that Master Pandemonium took them but didn't really take them because they were really pieces of his forfeited soul and the Avengers WC were all like 'whoa' and Agatha Harkness was all like 'yeah I knew but I'm such a punk I wasn't gonna say nothing about your freak kids' and Mephisto showed up and whupped out some devil-fu and Agatha got all domestic beastmaster and sicced her cat on him and the cat and Mephisto fought and at one point Mephisto turned the cat inside out and the Avengers were standing around saying 'eww, the cat's inside out' but it wasn't actually depicted because either Byrne was lazy or the scene ran afoul of the Comics Code and the reader was forced to use their own imagination? That thing is what I saw. It's a R.O.U.S. - Rodent of Unusual Size! jesus. that actually upset me! but seriously... I a'gonna' hava' ta' Swati' you if ya's keep that picture posting crazyness up! Every regular here... Dave C's okay... and the observations are beyond SuperFunCool. As FantasticFunCoolGreat this site is (and it is!!) 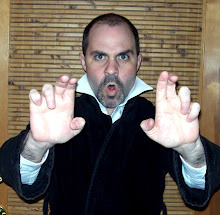 The Frickin' Velvet Maurader's blog... eh? eh? Okay, I'll say it... it... Rocks! "your early profile of Batman"
It's a Chinese Crested; they are an acquired taste. There is, in fact, a World's Ugliest Dog Contest, and that's the winner, so it's about as "official" as it gets. clarification: It's a deep fried Chinese Crested. Of course they are an acquired taste. Thanks so much for the post, quite helpful piece of writing.